Shoakecum/Chagum Mark on Deed~ | "Ever Widening Circle"
Publisher: Norwalk : Andrew Selleck ; New York : Ivison, Phinney, Blakeman & Co.
Pg 35: DEED FROM RUNCKINGHEAGE. This Indenture made the 15th of February 1651, Between Runckinheage, Piamikin, and Magise, and Towntom, and Winnapucke, and Magushetowes, and Concuskenow, and Wampasum, and Sasseakun, and Runckenunnett, and Pokessake, and *Shoakecum, and Soanamatum, and Prodax, and Matumpun, and Cockenoe-De-Long-Island Indians, of the one Partie, and Richard Web, Nathaniel Eli, Matthewe Marven, senr., Nathaniel Richards, Isacke More, Thomas Fitch, Thomas Hales, Richard Holmsted, Richard Seamer, Ralph Keeler, Matthew Marven, junior, Nathaniel Haies, Edward Church, Joseph Fitch, Planters of Norwake, for the use and behalfe of said Town, Witnesseth, that the said Runckinheage, and Piamikin, (&c. &c.) * * * * Have, and in and for the consideration of Thirtie Fathum of Wampum, Tenn Kettles, Fifteen Coates, Tenn payr of Stockings, Tenn Knifes, Tenn Hookes, Twenty Pipes, Tenn Muckes, Tenn needles, to them in hand paid, Have, and Every of them, for themselves and their heyers. Granted, Bargained, Sold, assigned, Enfeoffed, and confirmed ; and by these Presents doth Bargain, grant, sell, enfeoffe, assigne, sett over, and confirme, unto the said Richard Web, (&c. &c.) * * * all their lands called and known by the name of Runckinheage, Rooaton, or by whatsoever name or names the same is called or known, Lying and bounded on the East upon y^ land purchased of Captain Patriarke, so called, on the West bounded with the Brook called Pampaskeshanke, which said Brook and passage, the Bounds West, Extendeth up into the Country by marked Trees ; and so far as the said Runckinheage, and the rest above mentioned, hath any Right and proprietie ; and the aforesaid Land bounded with the Brook called as aforesaid Pampaskeshanke, from the aforesaid passage and path down along to the Sea. And the aforesaid Land bounded on the South with the Sea ; and on the North the Moehakes Country; with all the Islands, Trees, pastures, meadinge, water, water courses, Rights members, and Appurtenances whatsoever, To Have AND TO Hold, and quietly and peaceably injoy, all the aforesaid lands, &c. * * * unto the aforesaid Richard Web, &c. ***** and to their heyers forever. 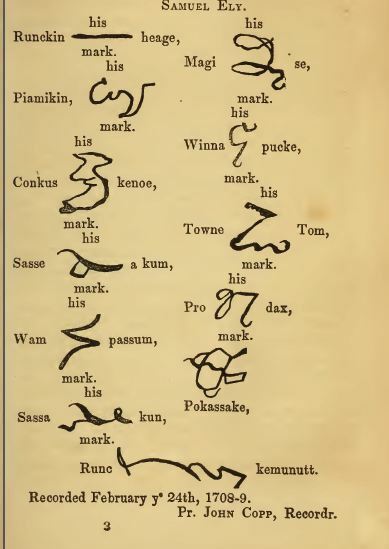 And the aforesaid Runckinheage and Piamikin, and Magise, and Townetom, Winnepucke, Magushetowes, Conkuskenow, Wampasum, Sasseakun, Runckenunnutt, Pokessake, Shoakecum, Soanamatum, Prodax, Matumpun, Cockenoe-de-Longe-Island, Do by these presents, acknowledge to have received the aforesaid Thirtie fathumof Wampum, &c. * * * * in full satisfaction. In witness whereof the above said parties have for themselves, and every of them, sett to their hands, the day and year above written to this present Indenture. Signed and delivered in the presence of Stephen Beckwith, Samuell Lumes, Samuel Ely. Pg 57: Dec 25, 1669. Boundaries. At a town meeting in Norwalk, June the first, 1670, it was voted and ordered that Lieutenant Olmsted and John Gregory, senr. ar to be joyned with Mr. Fitch and Mathu Marvin Jun. to git the bounds marked out between Norwalk river and Saketuk river as is expressed in a former order; and being so done to such satisfaction as their is exprest in that former order, the Indians are to receive six cotes at the town’s charg. At the same meting it was voted and concluded that their shall be two men chosen to prosecute the case against John Gregorie, senior, as touching the lands he howlds from the right of James the Indian, eyther by law or otherwise, as that they may howld and maintaine the rights which the town or any other land which he claims in the like natuer, as the island called Cokkanus Island. Allsoe at the same meeting [Feb. 20th, 1672], it was voted & agreed on that the sayd Island called Coekenoe, is to lye common for the use of the towne as the other Islands doe. “Whereas the inhabitants of the towne of Norwalk, have had possession of severall Islands lying adjacent to their township, and allso improvement of them forty yeares, and longer, without being interrupted by any persons laying claime and prosecuting their claime in due forme of law, the sayd towne having had quiett possession long before the sayd law of possession was enacted, and ever since ; the select men and justice doe in the name of sayd towne and for their behoofe, enter and record unto the sayd towne, them, their heires and assignes for ever ; namely Cockenoes Island known by sayd name, and Mamachimons Island, and the Long Island, and Camfield’s Island, known by sayd names, and all other Islands lying in or adjacent unto the towneshipp of Norwalk ; to the legallity of this record we whose names are hereunto sett and subscribed, our names and hands. James Olmstead, Justice and Recorder. Recorded this 4th day of January 1702—3.